Be sure to keep your Tales of Xillia save data. 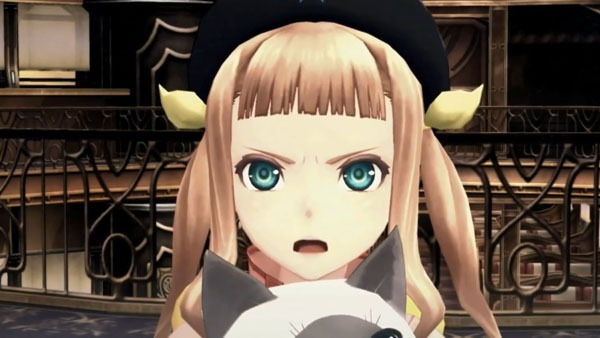 The idea for Tales of Xillia 2 began while we were making Tales of Xillia, but that wasn’t when it officially started, it was just being prepared so it’d be ready when we could work on it. After development for Tales of Xillia finished and the main members were added, we started working on it as a genuine project. In Tales of Xillia 2, I wanted to draw from Elenpios’ side, how the world would be as a whole, and how Rise Maxia would move about in it. People make various choices in the process of becoming an adult, and their lives change depending on the choices they make. Once you’ve made a decision, whether good or bad, it’s your personal responsibility. I set Ludger’s age at 20 so he’d have to deal with this process. Of course there is a justifying reason why I set the heroine Elle’s age at 8 years old. There are two types of pocket watch you see Elle holding in the trailer: a gold one and a silver one. Lulu doesn’t speak in common cat tongue. I wanted him to look interesting and various proposals came forth including thin cat designs. The final result was a slightly cute, big, plump cat. We changed the way various parts were shown compared to the previous title. Since the main stage is Elenpios, the main character and the heroine were changed completely. Ludger and company’s outfit designs are more modern simply because Elenpios is modern. Opposite the fantasy type representations of the past titles, I am attempting to make the world view flesh out “human civilization.” Of course in the same manner as before, the warmth of the world view is represented too. (About making Ludger a working adult with debts, etc.) As a full-fledged member of society, there are certain burdens one is responsible for, but that’s sort of a vague thing, it’s hard to introduce to people who aren’t there yet. So I thought up a way of representing “burdens” in a way that’s easy to understand with the “debts” feature. Although Ludger is burdened with various things, as an adult he has to settle things on his own while being conflicted, he can’t advance without accepting reality. The kind of “choice” he makes regarding those “conflicts” is up to the player. The scenarios don’t diverge much depending on the choices the player makes, but once you’ve decided something there is no undoing it. Ludger’s battle style lets him use three different types of weapons. Elle doesn’t participate in battles. Shee’s similar to the character Claire from Rebirth. We are currently in the midst of figuring how the characters level up, but we’ll gradually release more info about it later. The theme song sang by Ayumi Hamasaki has an upbeat temp. It’s a magnificent song featuring a strong guitar part, and it has a very speedy feeling. It was written in accordance with the previous title. Ufotable is making the opening animation for us. I want to visit various places worldwide with demo events and talk shows like “National Caravan.” I want to increase the places we’ll go compared to last year.